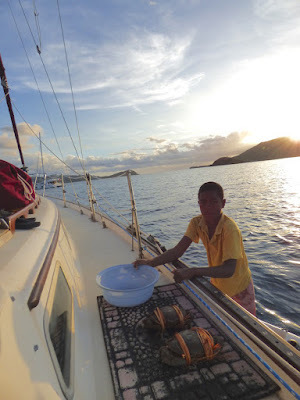 Galley Wench Tales: FIJI: Crab Boy... "Supersize Me"
FIJI: Crab Boy... "Supersize Me"
Local village boy drops by our boat to sell crab. Fiji Yasawas. "Tap-tap-tap, Bula!" sounded faintly, almost as if I'd imagined it. As usual, I didn't. Fingers gooey with meal prep, I convinced Wayne to quickly get presentable and find out who our visitor was and what they wanted. Before long, Wayne was calling me out. "Want crab? 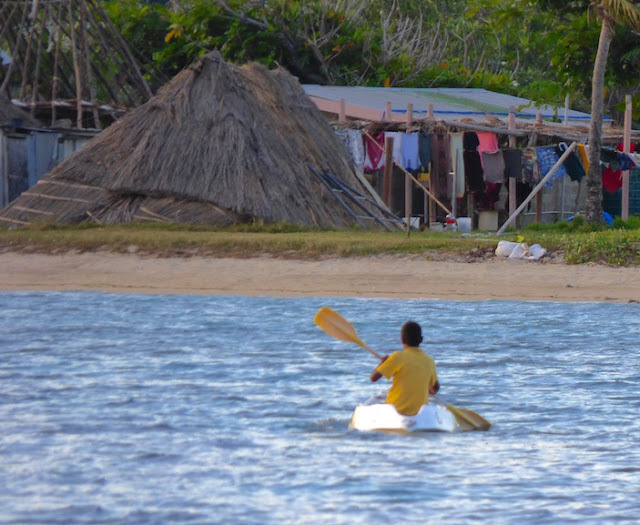 You gotta be the one to make the call on this...."
A local village boy in a small white plastic kayak, with very limited English skills was offering up the crabs he'd caught for sale. When it comes to sea food, I'm on my own. Wayne's two tasks are simply to offer money and to eat the end product. And that's a maybe on the latter from the man who married me despite his horror at watching me order and eat the "too cute!" Jake's quintessential crayfish in our early dating days. Crab boy paddles back to his village on his little white plastic kayak. Fiji, Yasawas, Sawa-i-Lau. Yes, there was no question the choice to purchase crab or not was mine. Crab happens to be one one my favorite sea foods. Still I recall Wayne's revulsion over the crab purchased when we first began cruising and cooked late into the night, its fragrant steam permeating our cabin all closed off to fend off the cloud of mosquitoes in British Columbia's Desolation Sound. Even if I forgot the incident, Wayne most definitely did and would not. Yet we also have this almost "Supersize Me!" philosophy that if a local offers us a freshly caught catch,unless it's a total rip-off, we'll buy it. Besides, we bypassed the village sevu-sevu as we heard from another cruiser when we were anchoring that the village was so over-run from tourists in for their $55/head cave tours, they didn't really care. But, buying the crab was in our minds a form of sevu-sevu. At least one family in the village would benefit from our purchase. We didn't have much cash, and a kid in a kayak isn't equipped to make change, so we bought the smaller $20 FJD (about $10 USD) we had exact change for. With dinner already underway, I popped the trussed up crab into some water, hope he's hold until morning, when I could cook him with the hatches wide open and Wayne could vacate the boat if he desired. In the morning I did some research and to my dismay read I'd have been far better off tossing him in the fridge. Crab can drown if submerged and unable to come up for air and are best eaten not much past their "expiration." Fortunately for me, if not the crab, Wayne resisted setting him free after our purchase and he was still alive and kicking when he was introduced to our cooking pot. 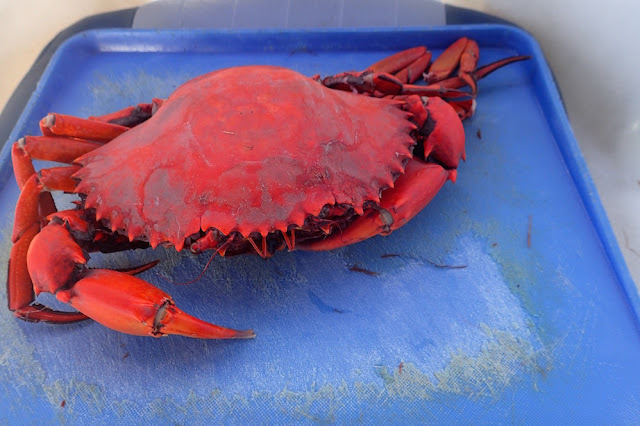 Rosy shelled crab, after its boil. Fiji Yasawas, Sawa-i-Lau. After all the work was done, I chilled what I was able to glean from Mr. Crab's generous legs and nearly empty body, mixed it with some cocktail sauce and served it up for lunch whilst we cruised to our next anchorage. Yes, Wayne ate it, as he did the crab cocktail from that far more fragrantly cooked crab from British Columbia. And they were both delicious. Still, I do confess to a certain squeamishness in killing my food before cooking and eating it. I have to remind myself it is no worse and probably better than the food I buy in the store that someone else killed for my consumption. Certainly, these wild culinary treasures likely live a better life and the food is certainly fresher and thus better for us. Next time though, someone offers me a crab, I may well let it loose rather than cook it up. Now underway, from Fiji to Vanuatu. 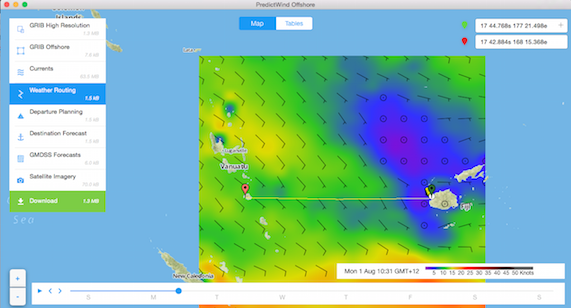 Predict Wind forecast of part of our passage. We're in the process of sailing from Fiji to Vanuatu. This post is from our time at Sawa-i-Lau in Fiji's Yasawas, (S16.50.808 E177.28.047), July, 2016. December 2014 to November 2015 we sailed over 10,000 miles from Florida to New Zealand. where spent cyclone season. In May, we sailed 1,000+ miles to Fiji. Next we’re off to Vanuatu (anticipating about a week's sail), New Caledonia finishing in Australia, 4,500+ miles later. There, around November, we’ll sell our boat, travel a bit, then go back to work …somewhere.